hiberfil.sys is a Windows 7 file which is related to the Hibernate mode. This file consumes a lot of space on your hard disk. If you don’t use the hibernate mode in Windows 7 then you can get rid of this file with ease. Whenever you use the hibernate mode to turn off your computer, Windows 7 stores all your current running program states on the hard disk so that the programs can resume where they left off when you start the computer again. All the necessary information is stored by the operating system in a file known as hiberfil.sys. Windows 7 stores this file in the Windows installation partition which is C Drive by default. Go to Start menu, type “cmd” in the search box and press Ctrl+Shift+Enter keys simultaneously. This will launch command prompt in administrator mode. 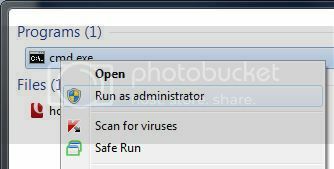 You can also right click on cmd.exe and choose Run as Administrator. Type the following without quotes and hit Enter. Once done, simply close the command prompt window. Now, restart your computer, you’ll notice that some space has been freed on your C drive.